Hit The Bottle have been releasing quite a few new things lately. I don't know about you but I always get super excited for new things to play with and Hit The Bottle do some amazing polishes! Michelle first shared the Jelly Shot Collection in the HTB Facebook Group (if you aren't part of this group then you can join here) and I fell in love. When she asked if I wanted to try them out I jumped at the chance. Along with the Jelly Shots Collection I also have the Vanish Without A Trace Topcoat to share with you today. Lets talk about the Jelly Shot Collection first - because they are super fun. 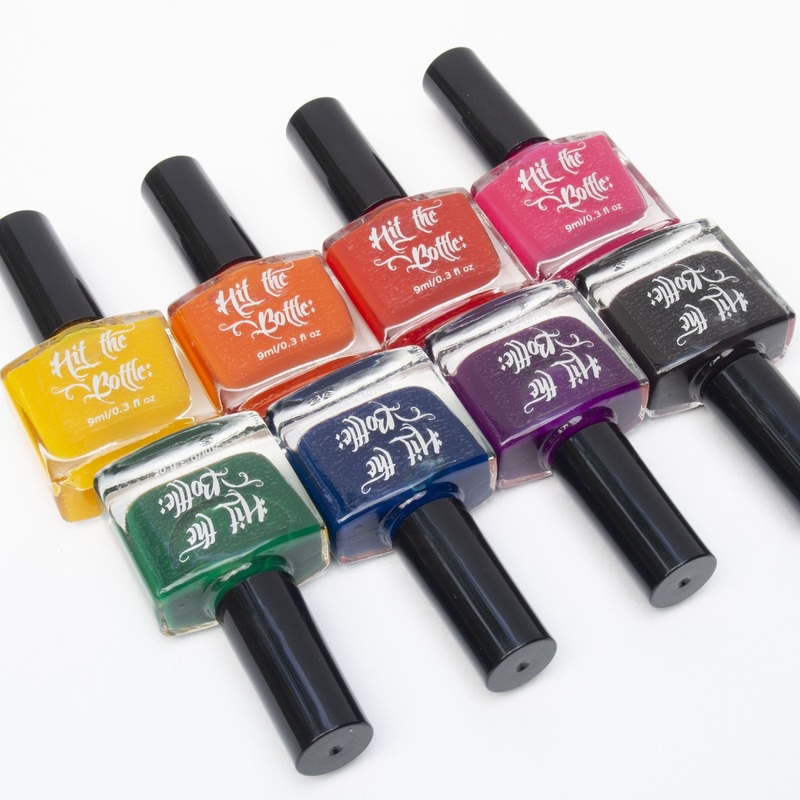 There are a total of eight jelly polishes - a full set of rainbow colours plus a black. I haven't tested these on a naked nail (I don't like visible nail lines) and automatically used white for my base for each of my manis. I love these polishes! For jelly polishes that have a great colour payoff and are quite vibrant. I am super excited to play with these polishes more! The first mani I did using these polishes was a rainbow gradient. 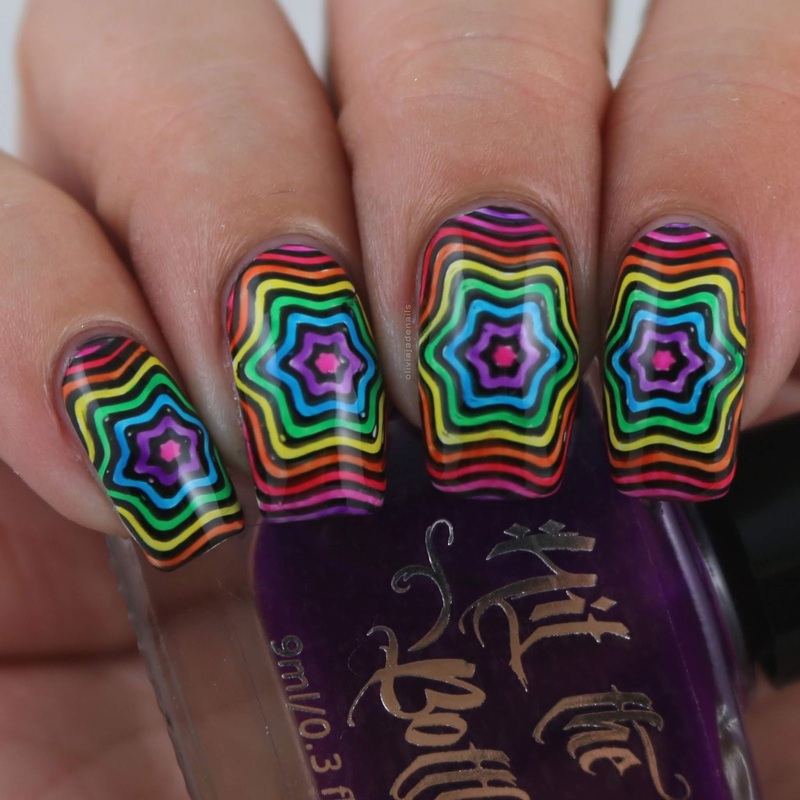 I don't know what it is about rainbow polishes that scream gradient to me, but they do. Whatever it is I am happy that I did a gradient. These polishes blend so well together. I should have left a bigger time gap between sponging on each layer (as you can see it is a little patchy - but that is 100% user error). For this mani I used all of the rainbow colours - Fireball, Screwdriver, Bubble Bee, Shamrocked, Blue Kamikaze, Purple Hooter and Pop Rocks - and did two coats. Now when you have gone to the effort of doing a gradient, the best way to make it last longer (or wear it for longer) is to stamp over it. 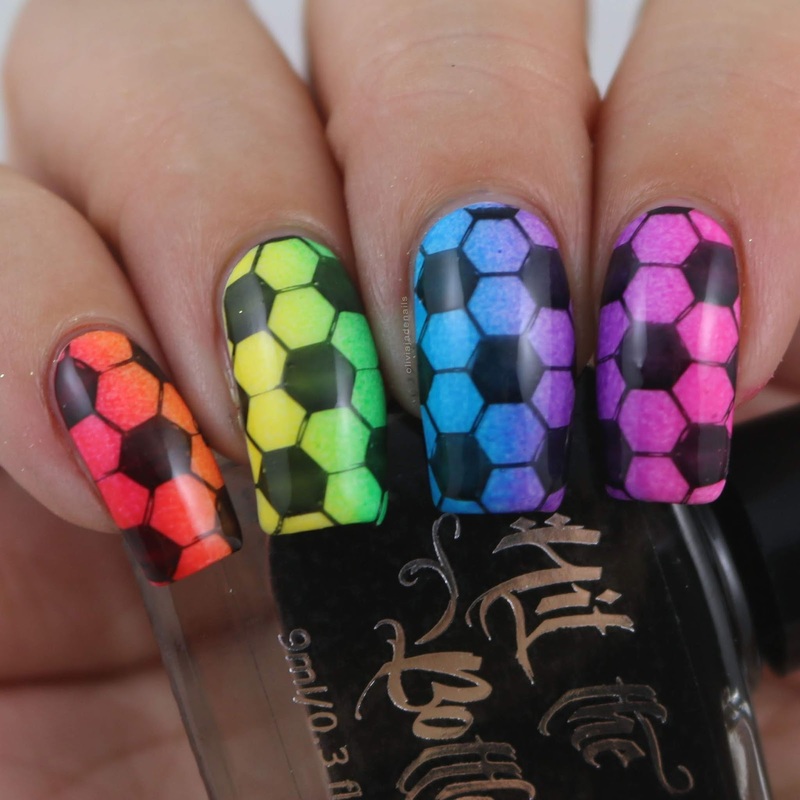 The image is from Uberchic Beauty Soccer Love Mini Stamping Plate. If you don't already know Hit The Bottle now stock Uberchic plates. Woohoo! Given that Hit The Bottle do a lot of stamping polishes I thought it would be fun to test out if this polishes stamp. Now before going into this next mani - the Jelly Shot Collection isn't designed to be be stamping polishes. That all said, these polishes create a really cool look when stamped over a white base. For this mani I used the entire Jelly Shot Collection and Lina Nail Art Supplies Make Your Mark 02. I wish that I had taken individual pictures after each layer so that you could see how they stamped. I decided that that best way to do so would be to do another stamped mani. For this mani I used Pop Rocks and Purple Hooter and Lina Nail Art Supplies Make Your Mark 02. This mani actually looks a little washed out in my picture than what it did in person. It really is super pretty. One of my favourite ways to use jelly polishes is lead lighting, so I couldn't go past a lead lighting mani for my review. One thing that I noticed with these polishes is how vibrant the colours are! 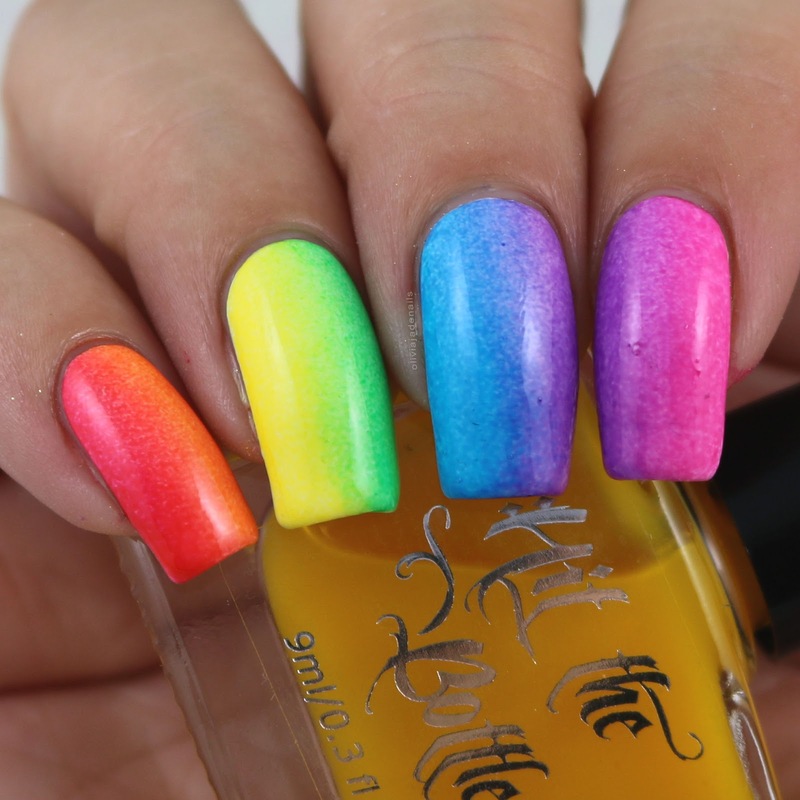 This mani was done using one coat of each of the colours. I think most of my other manis I have done with other jelly polishes I have had to do 2-3 coats for more vibrancy (and they probably wouldn't be as vibrant as these). 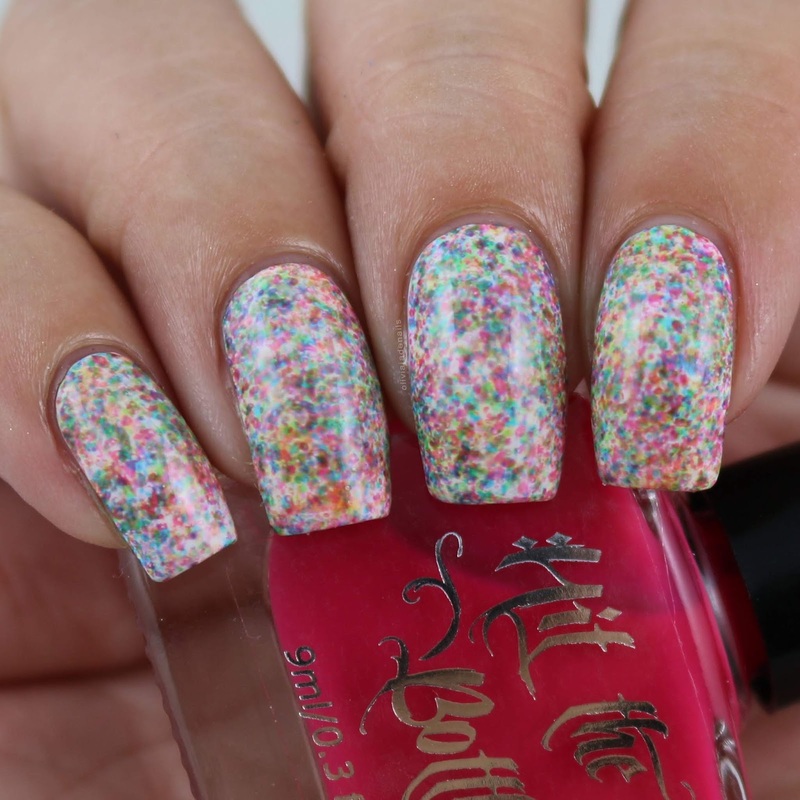 I used all of the rainbow colours and Lina Nail Art Supplies In Motion 02 stamping plate for this mani. I was thinking about what other types of manis that people would do with jelly polishes and a jelly sandwich popped into my head. This isn't really a mani that I would normally do (I think I have maybe done three including this mani in total). I used white for my base and painted on Pop Rocks. It's such a gorgeous colour, however it does apply unevenly on the first coat (as you can see in the first picture). It does even out on the second and third coats. For part two of this mani I used three coats of Pop Rocks and two coats of China Glaze Silver Of Sorts (I think that was the name of it). The Vanish Without A Trace Topcoat is a quick dry glossy top coat. This top coat is definitely quick to dry. It takes about 2 to 3 minutes to be dry (or at least touch dry) and is super glossy. So much so it does reflect that lights in my light box a lot so it does make some of my designs disappear. The formula is a little on the thinner side so I did find that it would flood a little, but then that is probably just user error. I usually use Seche Vite which is thicker so I could just be so use to that top coat. The Vanish Without A Trace Topcoat does have a scent to it. I'm not quite sure what it is but it is really strong. I personally am not a fan. That being said, people tell me that Seche Vite also has a smell but I can't smell it so I'm guessing the smell could be something that you get use to over time. Overall, I absolutely love the Jelly Shot Collection. If you are in the market for some jellies then I definitely recommend this. I am excited to play with these some more. I really want to do a random sponged mani! It's on my to do list. As for the top coat, I am impressed. I can't say that I will be converting from Seche Vite just yet, however I will happily use it as my back up top coat. The Jelly Shot Collection and the Vanish Without A Trace Topcoat are available now from Hit The Bottle. I love the gradient!! And the patchiness looks great with the look! Thank you! The patchiness does work with that image doesn't it?